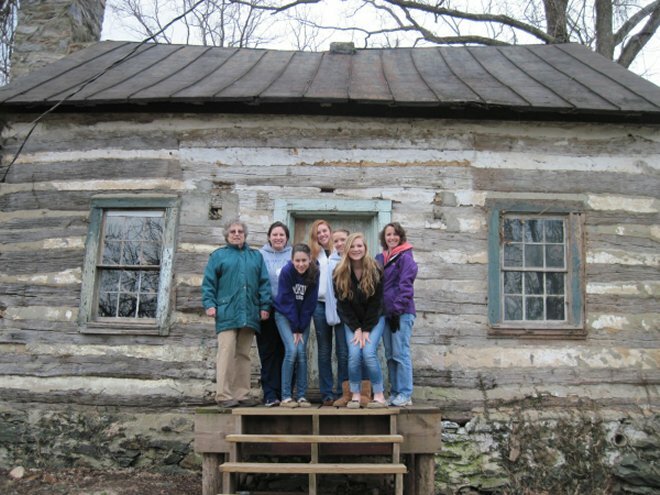 On February 25, 2012, six young volunteers from the Purcellville Baptist Church made Bluemont's Snickersville Academy part of their DNOW (Disciple Now) Youth Ministry Retreat. The Snickersville Academy, built in 1825 as a schoolhouse and house of worship, was the first public building in Bluemont's beginnings. Friends of Bluemont received the Academy as a charitable gift in September 2010 and is now working to restore the building and the site on which it sits as a historical park and a place for classes and events. The volunteers first spent time addressing envelopes, which was a substantial help for Friends of Bluemont's fundraising efforts on behalf of the Academy. They then walked to the Snickersville Academy to inspect the 187-year-old landmark. Photo shows Susan Freis Falknor (left), President of Friends of Bluemont, with volunteers.